Here’s a great example of tissue products, sustainability and the circular economy. In addition to making better use of the Earth’s raw material resources, a new recycling program developed in Italy has even had a positive impact for disabled persons riding the gondolas in Venice. The ‘circular economy’ is a concept that is currently getting a lot of attention. The idea is to apply smart recycling methods to get sustainability benefits and greater efficiency in the use of natural resources, while simultaneously reducing waste and pollution. 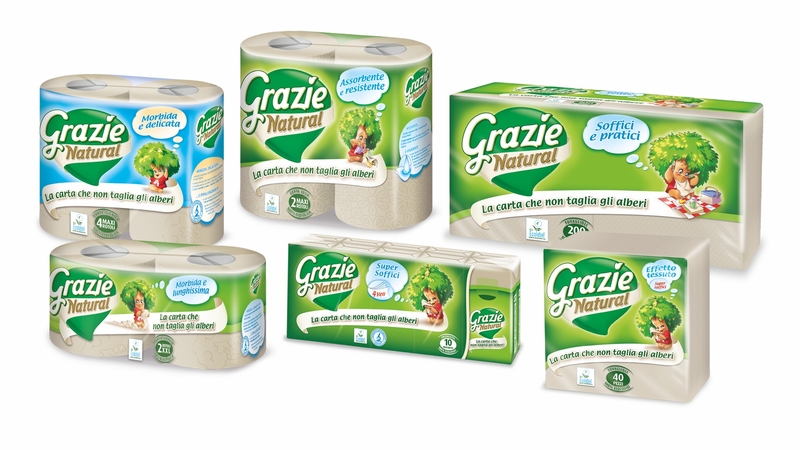 Over the past few years a unique cooperation between the Italian papermaking company, Lucart Group, and Tetra Pak®, the leading worldwide company for processing, packaging and distribution of food products, has led to very interesting advances towards achieving the circular economy. From this collaboration a new type of tissue paper, Fiberpack®, has been developed which gives a surprisingly wide range of positive benefits. 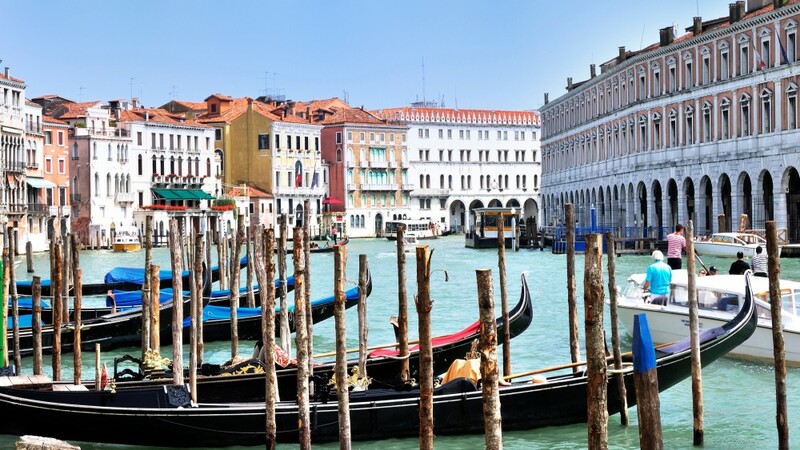 Material recycled from beverage cartons is not only being used to make new paper products, but also has reached Venice, the charming Italian city which is famous for its canals and gondolas. But before arriving there, let’s look at the background to the Fiberpack® program. Although recovered paper is widely used throughout the world as a source of papermaking fibers, beverage cartons had previously been difficult to recycle completely because they are composed of three different materials. The container is made up of approximately 74% cellulose fibers, 22% PE plastic in protective layers on the front and back, and 4% aluminum foil to give protection against light and oxygen degradation. These three components are tightly bonded together in layers in the container to give protection, stability and convenience for transporting liquids such as milk and juice, or foods like crushed tomatoes. Lucart is a leading Italian paper manufacturer based in Lucca, the Tuscan city between Florence and Pisa that is at the heart of an extremely dynamic papermaking region. The company has recently worked closely together with Tetra Pak® to develop the process which separates the beverage carton layers into useful new raw material streams. This successful separation gives numerous positive environmental benefits, as essentially all of the components of the cartons are used as raw materials to make new products, thereby reducing natural resource demand. The process also greatly reduces environmental impact that would come from waste disposal and landfilling of the billions of cartons. The cellulose wood fibers, which account for three-quarters of the mass in the cartons, are separated out and used as a valuable papermaking raw material. It is this stream coming from the recycling process that is called “Fiberpack®”. Fiberpack® is an excellent raw material for papermaking because the wood fibers are high-quality, long softwood fibers. These are ideal for giving important absorbency and softness properties to tissue products such as paper towels, bathroom tissue, facial tissue and industrial cleaning wipes. 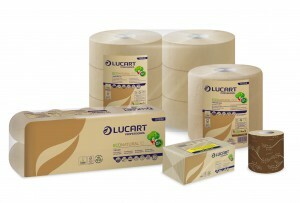 Lucart therefore uses Fiberpack® as a raw material for a wide range of its tissue products including the Lucart Professional and Grazie Natural product lines. 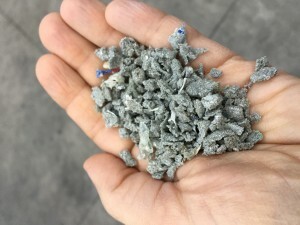 Besides recovering the wood fibers, the important innovation achieved in the project is the ability to successfully separate out and use the other composite materials: polyethylene and aluminum. These streams are mixed to create a new metallic-plastic raw material called AL.PE.®, signifying the combination of aluminum (AL) and polyethylene (PE), which is now being used in products that were previously made of other natural resources. The most important advance is that the process allows very clean separation of the plastic material from the wood fibers. Earlier processes were unsuccessful in producing a very clean plastic material which was not contaminated with residual fibers. However, the Lucart process has been able to get this clean separation. Among the items now being manufactured from AL.PE.® are lightweight shipping pallets and dispensers for tissue paper products such as paper towels and toilet paper. The pallets had traditionally been made of wood, while the dispensers were previously made from metal or plastic. The wood, metal, and oil-based natural resources that formerly went into these products have now been replaced with AL.PE.® which, before the process was invented, was simply being disposed of in landfills. De Luca says that the Fiberpack® project has explored a wide variety of other useful products, not specifically related to the tissue category, that can be made from AL.PE.®. One of the most interesting developments is a project that has been rolled out in Venice. Like many tourists, the AL.PE.® products have found their way into the famous city of Venice via the gondolas. 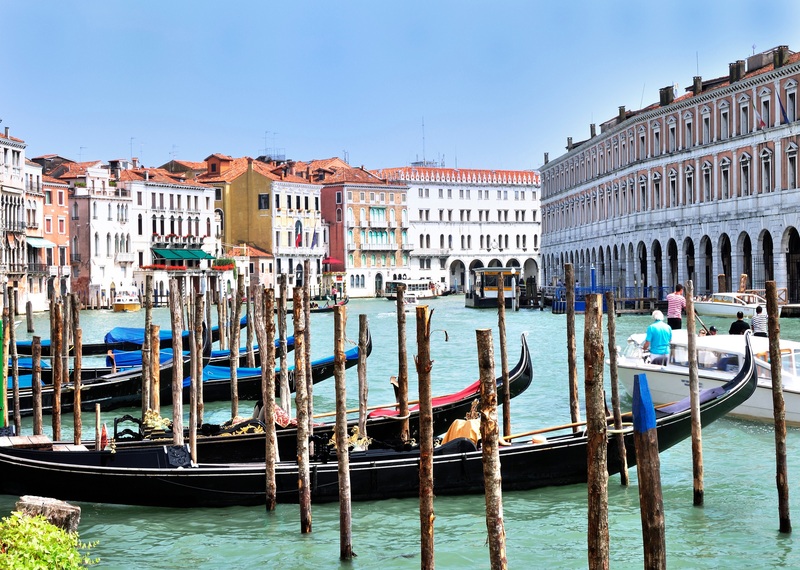 For centuries, the piers where the gondolas are docked, and from which people board the vessels, have traditionally been constructed of wooden poles sticking down into the water and seabed. However, over recent decades, seaborne woodworms have been attacking and destroying the poles at an increasing rate. This is a threat to the stability of the piers, and causes costly maintenance and replacement work. In an attempt to reduce destruction to the wooden poles, and the associated costs, a project has been underway over the past five years to replace old poles with new ones made from AL.PE.®, which is much more durable and resistant to degradation. 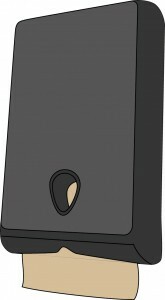 The project has been so successful, that a more ambitious one to improve gondola access for disabled persons in wheelchairs has been undertaken by a group called Gondolas4All – http://www.gondolas4all.com/en/ . This is certainly progress toward sustainability, with a very real example of how it is helping people with physical restrictions to enjoy one of the most famous and beautiful cities in the world. To complete the circle, Tetra Pak® Italy is also a customer of Lucart for the tissue paper products that it uses in its company’s plants and offices. These include bathroom tissue, paper towels, and industrial wipes. So Tetra Pak® is clearly demonstrating its commitment to this circular economy by using the paper products that come from recovered beverage cartons. The Fiberpack® project is being run at two of Lucart’s biggest plants, in Diecimo, Italy, not far from Lucca and in Laval sur Vologne, in the Northeast part of France. 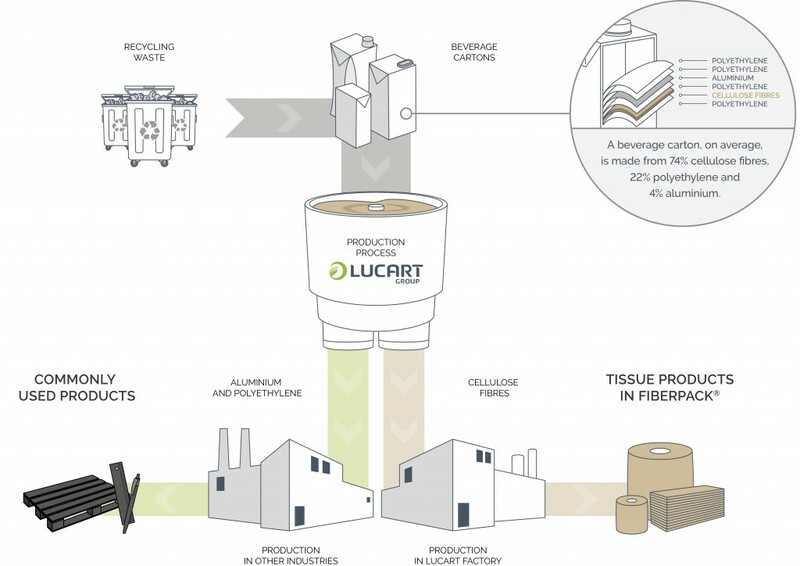 To confirm that the anticipated environmental benefits from the Fiberpack® program actually do result in such benefits, Lucart has commissioned a thorough lifecycle assessment (LCA) of the process. The results to show that, considering the complete lifecycle and Lucart’s specific plants, equipment and locations, the paper grades being produced with Fiberpack® do indeed have a lower overall environmental impact. The company has also created an environmental savings calculator, based on the LCA, which shows fiber savings as well as CO2e savings, and also the number of beverage cartons that avoid being landfilled. This allows customers like hotels or restaurants to directly assess the environmental savings coming via Fiberpack® and, in turn, to communicate the sustainability impact with their customers. But the work is not done; in fact it has only just started. AL.PE. as a useful raw material, making durable new products. 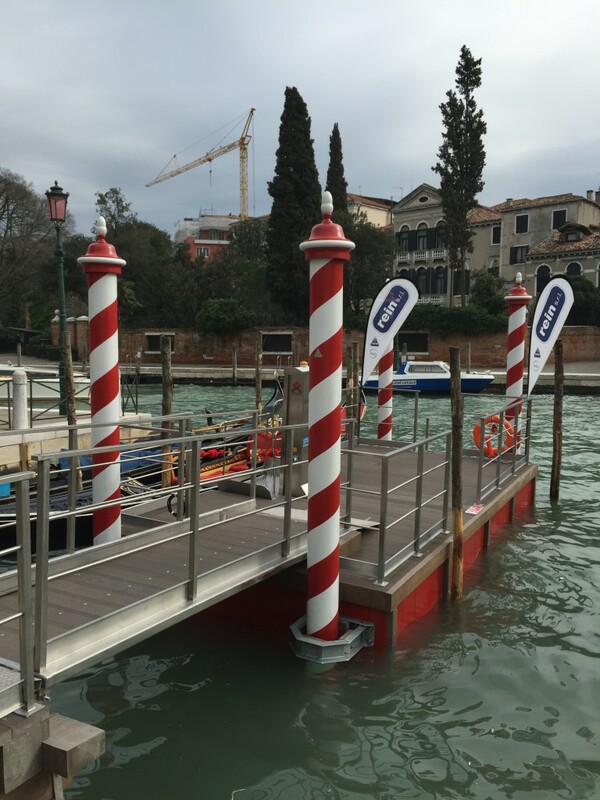 The Venice gondola dock, offering easy access for disabled people, is made mostly from AL.PE. The EcoNatural tissue product line made with Fiberpack. AL.PE. pallet used for shipping tissue paper products. Grazie Natural products made with Fiberpack. Tissue dispensers are also being produced with AL.PE.